It’s too easy to mock the title of ex-FBI Director James Comey’s memoir A Higher Loyalty. Higher loyalty to whom? Jim Comey? Comey himself anticipates the charge by confessing upfront in the Author’s Note that he “can be stubborn, prideful, overconfident, and driven by ego”, character flaws he has struggled with his “whole life”. No kidding. A Higher Loyalty: Truth, Lies and Leadership might be an exercise in self-righteousness, confesses Comey, but whether that is accurate or not—and our author, unsurprisingly, quickly proceeds to deny it—his enmity towards President Donald Trump happens to be based on something more substantial than Comey’s own bruised ego. Ethics is Comey’s word for it. I am, perhaps surprisingly, inclined to agree; but with the proviso that ideology rather than ethics be designated as James Comey’s moral compass. Andrew McCabe, Deputy Director of the FBI from February 2016 until March 2018, supervised both the Clinton private e-mail server investigation and, from July 2016, the counter-intelligence Operation Crossfire Hurricane in pursuit of the Great Kremlin Conspiracy or, if you prefer, Trump’s 2016 presidential campaign. McCabe was recommended for dismissal by the FBI’s own Office of Professional Responsibility in early 2018, and on March 16 he was fired by the Department of Justice just twenty-six hours before his planned retirement. It is no stretch to think that both McCabe and Comey will be in legal jeopardy when the full fallout from the investigation by Department of Justice Inspector General Michael Horwitz is felt. By Clinton’s account, she was unsophisticated both about technology and security, used the personal account for convenience to avoid maintaining dual government and personal email accounts, and still didn’t consider the contents of the emails to be classified. Her lack of technological sophistication is evident in her memoir, What Happened, in which she seems to intimate that her private server in Chappaqua was protected from hacking because it was contained in a home guarded by the Secret Service. Hacking a server is done through the internet, not by breaking the glass in a basement window. 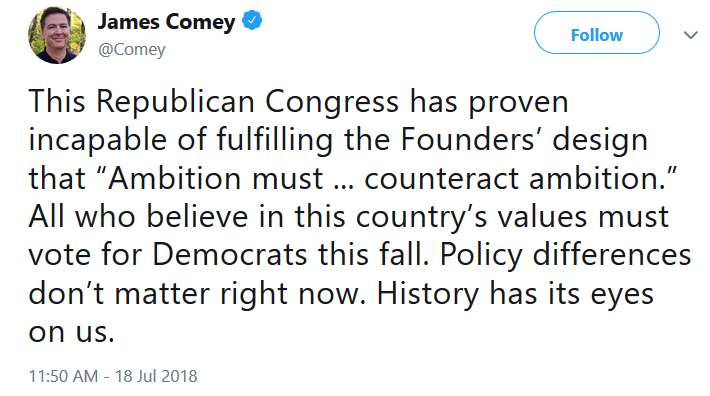 Comey prudently adds that his role in the FBI’s Clinton investigation was only to “make final decisions” and “not to conduct the investigation in the first place”. 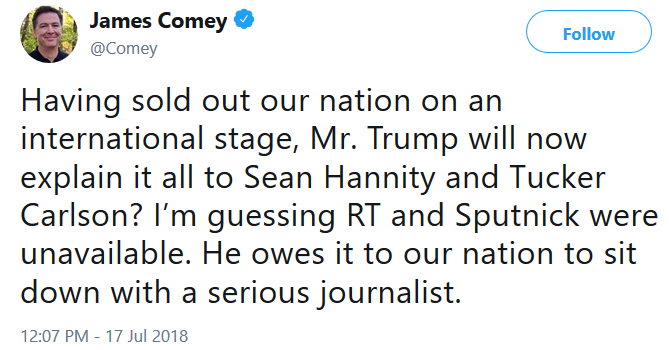 The buck never stops with James Comey. James Comey now claims he was the victim of the Clinton private e-mail server controversy. The discovery of hundreds of thousands of e-mails from Hillary Clinton’s private server on Anthony Weiner’s laptop in September 2016 forced Director Comey to re-open the case twelve days before the election, earning him Clinton’s undying wrath. Even though he managed to close the case again four days before Election Day, Comey tells us that he remains “nauseous” and “nauseated” by the very real possibility his Weiner-laptop announcement on October 28, 2016, swung the election in Donald Trump’s favour. I am sure he does, but hundreds of thousands of Hillary Clinton e-mails found in Weiner’s possession is not something even the FBI’s “sensitive matters team” thought they could hide indefinitely. Now, according to Comey, the “lying partisans” on both sides of the political divide had an excuse to hate the principled policeman whose only loyalty was to the independence and integrity of the FBI. Only one member of the opportunistic and boorish political class, in the opinion of James Comey, had the civility to acknowledge the FBI director’s honesty; and that person was Barack Obama, shortly after Hillary Clinton’s upset loss. “I picked you to be FBI director because of your integrity and your ability,” the President told Comey, before adding: “I want you to know that nothing—nothing—has happened in the last year to change my view.” Comey, on the verge of tears, replied: “That means a lot to me, Mr President. I have hated the last year. The last thing we want is to be involved in an election. I’m just trying to do the right thing.” Obama’s beneficence, masked by a disciplined demeanour that betrayed little outward emotion, overwhelmed the grateful Comey, who blurted out the following: “I dread the next four years, but in some ways I feel more pressure to stay now.” Obama simply patted Comey on the shoulder and shook his hand—and said nothing. I walked out the side door, stepped into the armored car, and headed to the Manhattan FBI office to do what I loved. I walked floor upon floor of FBI offices and cubicles, thanking incredible people for their work. After the uncomfortable conversation I’d just had, it was like taking a shower. Comey’s dishonesty about the provenance of the Steele Dossier—and the uses to which is was put—is astonishing. Nowhere in A Higher Loyalty, for example, is there any mention that the salacious dossier was paid for by Hillary Clinton. He also omitted this trifling detail when he activated the intelligence community’s powers, through numerous FISA warrants, to surveil Team Trump during the 2016 campaign. Indeed, as recently as April 26 this year, Comey insisted in a book promotion interview that he still isn’t sure if Hillary Clinton financed the Steele Dossier: “I still don’t know that for a fact. I’ve only seen the media.” As for the authenticity of the dossier, Comey—both in the book and during his television interviews—likes to imply that it could be true without ever committing himself one way or the other: “The answer is, I still don’t know.” Or, as he once (supposedly) remarked to Trump when the president asked if the FBI could establish an investigation to refute the prostitute story, it’s not easy proving something did not happen. Has Comey ever read Kafka? In November 2017, Hillary Clinton—as everybody knows apart from James Comey—admitted to commissioning the Steele Dossier after being approached by Fusion GPS: “[My lawyer Marc Elias is] an experienced lawyer, he knows what the law is, he knows what opposition research is.” Comey’s “unawareness” of the provenance of the Steele Dossier might have had something to do with the fact that a week before, in his television interview with George Stephanopoulos, he conceded that he chose not to tell President-elect Trump on January 6 that the Steele Dossier was paid for by Hillary Clinton. “Did Trump have a right to know that?” responded Stephanopoulos, not exactly a supporter of Donald Trump. James Comey’s answer is as farcical or duplicitous as Hillary Clinton’s “cloth or something” line: “I … it wasn’t necessary for my goal, which was to alert him that we had this information.” So, the provenance of perhaps the most scandalous intelligence that Comey, America’s principal secret policeman, could bring before the man about to be sworn in as the president of the United States is somehow beside the point? Comey, furthermore, was not satisfied with merely misinforming the President-elect. During their second one-on-one conversation, a phone call taken on January 11 from the seventh floor of FBI Headquarters, President-elect Trump again protested his innocence of the Moscow “golden showers” accusation or, as Comey put it, Trump “delivered his defense on a subject I didn’t care about”. However, Director Comey, we now know, was tremendously interested in the Steele Dossier and the salacious details contained within. The prostitute episode, which hypothetically took place in the early hours of November 9, 2013, is the outrageous core of the Steele Dossier and a key rationalisation for why Donald Trump allegedly became Vladimir Putin’s “Manchurian candidate” in the 2016 presidential election. I decided not to tell him that the activity alleged did not seem to require either an overnight stay or even being in close proximity to the participants. In fact, though I didn’t know for sure, I imagined the presidential suite of the Ritz Carlton in Moscow was large enough for a germophobe to be at a safe distance from the activity. I thought all of that and said none of it. He is even more contemptuous of President Trump in their January 27, 2017, get-together at the White House, and not just because he disliked “the idea of a third discussion of Russian hookers”. He says President Trump worried there might be “even a one percent chance” Melania thought the “golden showers thing” was true. James Comey, at his sanctimonious best, writes: “In what kind of marriage, to what kind of man, does a spouse conclude there is only a 99 percent chance her husband didn’t do that?” Maybe Melania Trump would have been even more disbelieving had Director Comey not neglected the bit about it being Hillary Clinton’s “opposition research”. In multiple memos, Comey specifically mentioned that CNN had the dossier and wanted a “news hook” that would enable the network to report on its most salacious allegations even though they had not been verified … No media organisations had reported the allegations at the time Comey briefed Trump. The “news hook”, just as the co-conspirators Comey and Clapper planned, was Comey notifying Trump on January 6 about the Steele Dossier. CNN, thanks to leaks from the highest echelons of the intelligence community, ran with this headline on January 10, 2017: “Intel chiefs presented Trump with claims of Russian efforts to compromise him.” Within minutes of the CNN story appearing, BuzzFeed published the entirety of the dossier: the mainstream media now had their “news hook” and with no small thanks to James Comey. Comey’s duplicity never rests. He describes his “good friend Dan Richman”—the person assigned to leak (Comey’s version of) these confidential Trump chats to the press in order to spark a special counsel—as simply “a professor at Columbia Law School”. We have since learnt that Richman has been a “special government employee” for the FBI, albeit an unpaid one, and was even mentioned in correspondence between the bureau’s disgraced and demoted Peter Strzok and the reassigned and now retired Lisa Page. Comey somehow forgets to mention Professor Richman’s role as an adviser to the FBI’s “sensitive matters team” in the Clinton private server investigation and Operation Crossfire Hurricane. Some readers of A Higher Loyalty might begin to wonder if our memoirist is on the level about anything. the agents … discerned no physical indications of deception. They didn’t see any change in his posture, in tone, in eye contact. They saw nothing that indicated to them that he knew that he was telling a very different story. The saga of Comey, Clinton and the emails is being bitterly re-prosecuted in the media—and the credibility of Comey as a witness to Trump’s moral poverty is being undermined by Clinton aides who still consider him the devil. Ethical leaders make the hardest decisions by looking at some reference point. For some it’s a religious tradition, or history, logic or philosophy. But his reference point seems to be entirely internal. What will fill the hole in me and get me the affirmation I need? McKenzie-Murray partly understands that his championing of Comey, and Comey’s own hysterical attacks on the President of the United States, are somewhat odd: “But it is very hard to overstate the historic strangeness of a former FBI director likening the president of the United States to a mob boss.” There is nothing but for McKenzie-Murray to go all in and agree Comey’s mafia boss analogy is “magnetic” and all the more authoritative for Comey having prosecuted actual mafia bosses in the past. But there are, surely, hazards in acclaiming the candour of Big Brother, especially one as disingenuous as James Comey. There is the very real danger that McKenzie-Murray and his kind are setting themselves up for a fall by accusing President Trump of lying “about everything” and possessing “a liquid capacity for deception” while passing off A Higher Loyalty as truth. The fall could come in the form of testimony by members of the “sensitive matters team” who, wishing to remain out of jail, are ready to spill the beans on the Clinton private e-mail caper and the Great Kremlin Conspiracy. One name often mentioned is William Priestap, head of the FBI’s Russian conspiracy operation from July 2016. In his March 20, 2017, testimony before Congress, Director Comey justified his failure to inform congressional oversight about Operation Crossfire Hurricane because the FBI’s Director of Counterintelligence told him not to do so. The name of the scapegoated FBI man, not provided on the day by Director Comey, is Bill Priestap. There will be others, maybe Agent Peter Strzok and Attorney Lisa Page, who might have some scapegoating of their own to pursue. In any case, the theme of the DOJ Inspector General’s next report, dealing with the FBI’s handling of the Clinton e-mail probe, is likely to diverge somewhat from the premise of A Higher Loyalty. The question, finally, is why did James Comey politicise an institution he repeatedly praises for its independence? One part of the answer, at least, is to be found in the aftermath of the San Bernardino massacre on December 2, 2015. Director Comey’s public comments are at odds with Candidate Trump’s talk of “radical Islamic terrorism”, and yet entirely in sync with the politically-correct balm of President Obama and Candidate Clinton. To Comey, Donald Trump, in short, is a shady conman who adopted the pose of a political rabble-rouser to filch the presidency. Though Director Comey could never bring himself to love Crooked Hillary, as he did Barack Obama, she was nevertheless what stood between the barbarians at the gate and the citadels of power. Here, then, is James Comey’s much-vaunted higher loyalty. He said as much in April this year: “Hillary Clinton is more meshed in, trained in, respectful of the norms and the traditions that I’m so worried about being eroded today.” Norms and traditions, of course, look very different from the seventh floor of FBI headquarters and the back seat of a chauffeur-driven armoured vehicle than they do from the unemployment line in Michigan, Pennsylvania or Wisconsin. 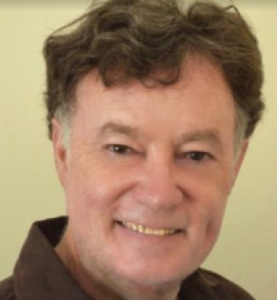 Daryl McCann has a blog at http://darylmccann.blogspot.com.au, and he tweets at @dosakamccann. He wrote on President Trump’s approach to Asia in the May issue. Comey has now outed himself as a DemonBrat Psychophant, yet wats us to believe he is honest and independent. I was wondering where Peter Strzok got his histrionic ‘defence’ of his behaviour from. The Deep State is a filthy swamp indeed, which is why our apprentices gravitate from Oz politics to the masterclass in the USA – taking a few $M’s in Oz taxpayer donations to the Clinton Foundation and kleptocrat tyrants with them.